More than 180 ethnicities are represented in Brooklyn and over 90 languages are spoken in the borough, with 47 percent of residents speaking a second language in their homes. These diverse groups will all celebrate together as part of the borough president’s third annual International Friendship Day this Sunday, Aug. 7, from 1 to 5 p.m. The Unity Parade of Flags will kick off the International Day of Friendship Celebration. The borough president’s youth and country delegates will carry the flags of all 193 countries that are member states of the United Nations. Starting at 1 p.m., delegates and parade marchers will walk from Fulton Mall to Borough Hall at 209 Joralemon St., a spokesman for the borough president told the Brooklyn Eagle via email on Monday. During the first two years, the International Day of Friendship celebration took place in the northernmost stretch of Cadman Plaza Park. This year, however, the parade and festival will take place at Borough Hall and adjacent Columbus Park. 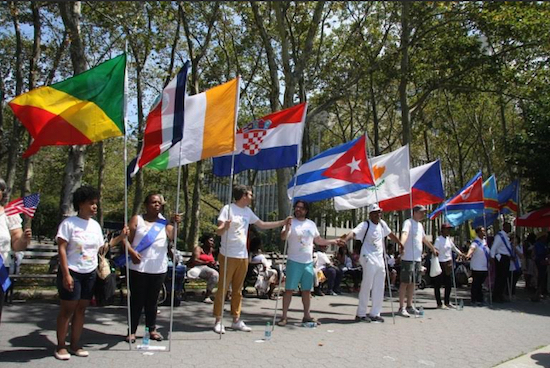 During the Unity Parade of Flags, delegates from each country will stand and hold hands, forming a human chain around the park with youth from all neighborhoods across Brooklyn. A ceremonial handing off of the flag will show the significance of bridging the gap in generations and throughout the world’s people. This International Day of Friendship will highlight performances specific to continental regions. The cultures of various countries will be showcased through reading, dances or music. These performances will start at 2:30 p.m.
What better way to orient oneself with a new country or culture than through food and drinks? Tents will offer delicious food from around the world — all provided for free. At least two restaurants will represent each continent (except perhaps Antarctica). International Day of Friendship is one of many ongoing ethnic heritage programs that Brooklyn Borough President Eric L. Adams has sponsored. He also continues his predecessors’ custom of cultural heritage months. For example, this year Adams has celebrated Irish American Heritage Month on St. Patrick’s Day. He has also saluted the Greek, Arab, Asian Pacific, Caribbean and Russian communities. This autumn, Adams will celebrate Hispanic American and Italian American months.